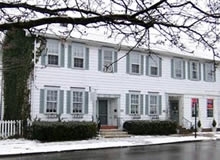 The Mainstay at Saxonburg is ideal for guests visiting town as well as the business person in need of lodging. Relax in our comfortable home for one night or several. We can help direct you to the many offerings of the region or if you like, slow the pace down and just enjoy the small historic town. The old home built in the 1830s has been updated with many modern conveniences. Our accommodations include four air conditioned guest rooms each with a private bath. All rooms offer bath robes, a hair dryer, iron & ironing board, an AM/FM alarm clock radio and satellite TV. Wireless internet access is available throughout the house. The library and living room are open to all our guests for use at anytime. Weather permitting you may enjoy our outside courtyard and roof deck. During your visit, wake up each morning to an upscale continental breakfast in our bistro. Please contact us to confirm your reservation or to get more information about our current rates and discounts.